Select a local phone number in any area code or choose a toll free number in any toll free prefix (800, 888, 877, 866, 855, 844, or 833). Use your virtual PBX phone system to greet callers and route them to any combination of phones, employee extensions, department extensions, or voicemail. Your virtual PBX gives you the ability to run your business using your existing phones (home, office, or cell) and is managed completely online. A virtual PBX from UniTel Voice gives you all the bells and whistles of a traditional PBX business phone system, minus the cost and complexity. Because our virtual PBX is hosted in the cloud, there’s no need to manage any equipment or update any software. With UniTel Voice, any business, on any budget can look, sound, and operate like a Fortune 500 company. 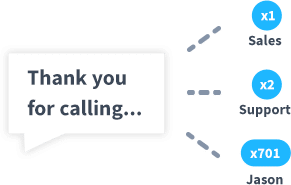 When a call comes in, your virtual PBX greets the caller and transfers the call to the proper employee extension, department extension, or unavailable greeting. And the best part is, UniTel Voice works with your existing phones so wherever you are (home, office, or mobile), you’ll never miss a call. With UniTel Voice you can use a 1-800 number to give your company a nationwide presence. 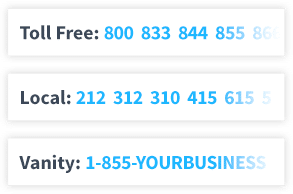 We have toll free numbers available in any toll free prefix including 800, 888, 877, 866, 855, 844, 833 or you can choose a custom vanity number that’s branded just for you. You can also choose to use local phone numbers from any area code in North America as your business’s primary or secondary telephone numbers. Using a phone number with an area code people recognize can give your business a local presence in any city. 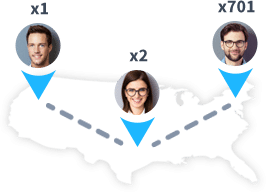 You can even use multiple local numbers for a multi-location presence. Why Get a Hosted PBX from UniTel Voice? UniTel Voice is one of the cheapest and easiest-to-use virtual PBX providers available. We offer affordable hosted PBX plans for designed for startups and growing businesses. All virtual PBX plans include the same amazing features and 100% USA-based support (available by phone, chat or email) to ensure your phone system is up and running fast and easy. 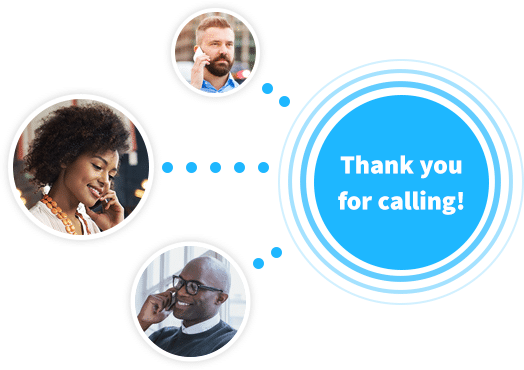 UniTel Voice uses an industry-leading network with world-class reliability to keep you connected, so cheaply priced virtual PBX software still means high call quality. Every UniTel Voice plan includes a free high-quality recording from our voice talent studio, so your cloud-based PBX greetings always sound professional and leave a great impression. 1. In total layman’s terms, what the heck is a Virtual PBX? First, let’s define a traditional (on-premise) PBX (or private branch exchange) which is essentially a physical piece of business telephone system hardware and software that routes calls to multiple internal and external phone lines via an auto attendant (or automated attendant). With the dawn of VoIP (voice over internet portal) in the late 1990s, the PBX cluster of hardware and software that sat in your phone closet was moved to the cloud, giving rise to a next-generation cloud-based business phone system called a virtual PBX (also dubbed a hosted PBX, mobile PBX or cloud PBX). These cloud phone systems required no equipment to maintain or software to update, they were easier to use and less expensive. 2. How much does a virtual PBX cost? Unlike traditional (on site) PBX phone systems that required you to install and maintain expensive equipment, virtual PBX phone systems are extremely affordable for businesses of any size. 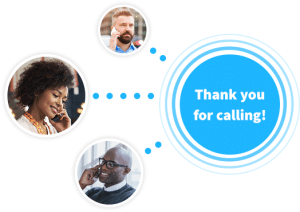 Here at UniTel Voice, you can virtual PBX with unlimited department and employee extensions, greetings, users, and voicemail for as little as $9.99/month. 3. Is a hosted PBX hard to set up? Not with UniTel Voice. We’ve designed our system to be as intuitive as using email. And we’ve worked hard to build in FAQs, and how-to videos, directly into our product. But you’re never alone. We offer free customer support from real humans that are happy to chat with you one-on-one online or over the phone. Our team is here to help you get up and running fast and easy. We even offer a free do-it-for-you concierge service where we’ll set up their virtual PBX greetings, call forwarding and voicemail for any customer and also provide them with a professional recording from our voice talent studio. 4. Can my virtual PBX forward to cell phones? Yes, with UniTel Voice you can set up your cloud-based PBX to greet and transfer calls to any combination of phones including cell phones, home phones, office phones, smartphones, softphones, or IP-phones or directly to an unavailable greeting if your business is closed. And because UniTel Voice is a virtual phone system, you can make changes and manage everything online or via smartphone app 24/7. 5. What makes UniTel Voice’s virtual PBX better than other hosted phone service providers? Our virtual PBX is priced and designed for small business owners and growing startups who need a professional business phone system that’s affordable and easy-to-setup. Our virtual PBX system works with your existing phones so wherever you go, you’ll sound professional and stay connected. We’re extremely competitive on pricing and we do our best to offer over-the-top customer support to help you get set up as fast and easy as possible. At the end of the day, whether you’re looking for call quality, features, customer service or all of the above, where confident UniTel Voice is the right service provider for you. There are no setup fees, no contracts and we offer a risk-free 30-day money-back guarantee, so if you don’t love us we’ll refund your money, no questions asked.